features his appealing son Dante. De Blasio's spurt to a decided lead in the race for the Democratic nomination has huge implications. He is ahead in two independent polls - leading by 32% vs. 18% for Thompson in the NYTimes-Siena College poll (with Quinn #3) and by 36% in the Quinnipiac poll, which despite its name put Quinn in second place with 21%. The possibility that de Blasio could win 40% of the vote and avoid a runoff now presents itself. 1. His "al Dante" (my term) campaign appeals to the minority vote (taking away from Thompson) by featuring his charming afro-topped son Dante giving him an unmistakably sincere endorsement as a father. 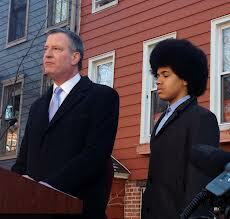 De Blasio is now being attacked for using his son in this way. That may work - or it may be seen as a desperate move by his opponents and may backfire. 2. His fix-the-tax-mix approach appeals to the soul of the Democratic primary electorate by noting the high degree of income inequality in New York City and the fact that it has been increasing. Valid concerns, but hard to do much about at the local level. The biggest problem is that the Federal payroll tax is regressive, taxing the first dollar of payroll and cutting out at $113,700. NYC has hungry competitors to the north, west, east and south who have numerous Tax Foundation charts (both fair and unfair) to point to if NYC tries to fix income inequality on its own. De Blasio leads the other candidates in every main category - among both men and women, both young and old, and both the optimists and pessimists about NYC. Of likely Democratic voters, the NYTimes-Siena College poll indicates that 45 percent view Quinn unfavorably (the de Blasio and Thompson figures are 17 and 16 percent), perhaps thanks to the well-financed anti-Quinn campaign. I'm a Registered Democrat. However, I try to be objective when I am asked by friends to comment on the implications of the new NYC polls for possible political outcomes. Quinn and Thompson have been keeping the tone of the campaign fairly somber. The new polls suggest this isn't working, and with ten days to go till the election, it's hard to change the strategy. Attacking de Blasio's son for supporting his father, or vice versa (#GoWiththeFro), doesn't sound to me a good way to turn the tide. If the battleground is who can do the most for young people and black youth in particular, it seems to me de Blasio wins. What it means for November in my view is that if the de Blasio lead in the polls continues to hold up, the GOP candidate (Catsimatidis and Lhota are the two most likely to be nominated) has a better chance now than any of them had any right to expect hitherto. To find out more about candidates you hadn't paid any attention to heretofore, go to the Campaign Finance Board, which has an on-line Primary Election Voter Guide now available here or here. NYC MAYOR | Can Catsimatidis Get GOP Nod?